Arlington, Virginia and Ivano-Frankivsk, Ukraine have not been sister cities for very long. Ivano-Frankivsk has a long history of being an important and diverse trade center and is the capital of the Ivano-Frankivsk region. The two cities signed their agreement in 2011, and since then have been conducting exchanges mutually beneficial to their communities both professionally and economically. The most recent exchange between the two cities was a professional firefighter exchange. Three Ukrainian firefighters, Chief Volodymyr Chernetskyi, Taras Kochkodan, and Mykola Burlak accompanied by their translator, Oleksi Chernetskyi, visited Arlington, VA from September 25 through October 6, 2017. The program invited the firefighters to visit Arlington in order to learn about Arlington’s Fire Department. Arlington County’s Board Chair Jay Fisette, who visited Ivano-Frankivsk back in May of 2017, invited the firefighters for a visit. During their stay, the firefighters stayed with Fire Station 5 Commander Captain II Tiffanye Wesley. She ensured they had proper amenities as well as a busy professional program complete with working two shifts with Arlington firefighters. The Ukrainian guests repaid their hosts by preparing two of the meals while they were in Arlington—rumor has it that there were no leftovers to enjoy the next day! The firefighters also met with County Board Chair Jay Fisette to share their thoughts about this experience in the US as well as discuss the possibility of Arlington firefighters partaking in a similar exchange in Ukraine. The exchange was invaluable to Ukranian participants and the Ivano Frankivsk team has already set up a training session to demonstrate what they learned from their fellow firefighters in Arlington. 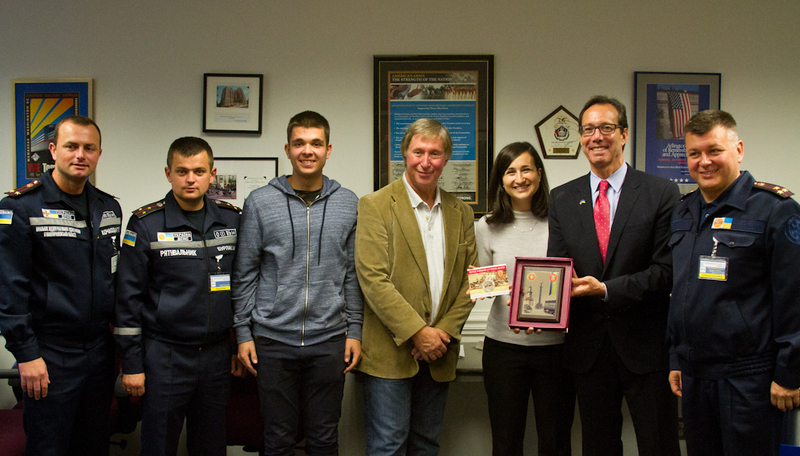 The Arlington Sister City Association (ASCA) funded the Ukranian delegation’s transportation to and from Arlington and the Arlington County’s Fire Department hosted the Ukranian firefighters. The ASCA’s Ivano-Frankivsk Committee also helped to organize this intensive and memorable exchange. More exchanges with Ivano-Frankivsk are in the works and the city’s mayor may be visiting Arlington in the near future. No Replies to "Ukrainian Firefighters head to Arlington Virginia for Professional Exchange"